You can use the <Rejected> port in a variety of ways. You may wish to keep the rejected features and allow the workspace to continue to run. In this case, connect the <Rejected> port to the next input port. Or to log bad features, add a writer, or a Logger transformer. In other cases, you may wish to terminate a workspace when invalid features are detected. In this case, set the Rejected Feature Handling workspace parameter to terminate the translation when the first feature outputs to a <Rejected> port. Alternatively, connect a Terminator transformer to the <Rejected> port. 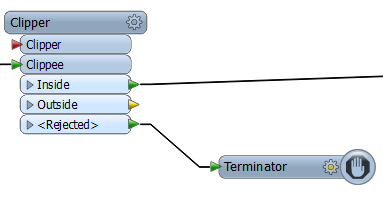 Use the Terminator Redirect workspace parameter to terminate the translation or redirect to an Inspector. Note: Keep in mind that workspace parameters apply to the entire workspace, rather than a single <Rejected> port or Terminator. Tip: To ensure no features are written before a translation terminates, use a FeatureHolder transformer.